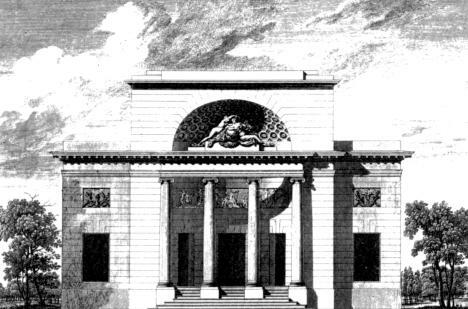 Claude-Nicolas Ledoux (1736-1806) was the opposite of Boullee: an architect who built much and turned to theory only late in his career. 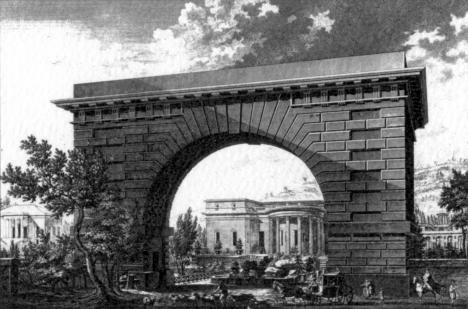 Yet his work quickly developed visionary qualities that are readily apparent in his most important achievement, the 50 tollgates he designed for the new walls around Paris in 1785-89, of which only four still exist. (The rest were dismantled during the French Revolution.) Our example (fig. 873) shows a remarkable sense of geometry placed at the service of. a singular imagination. 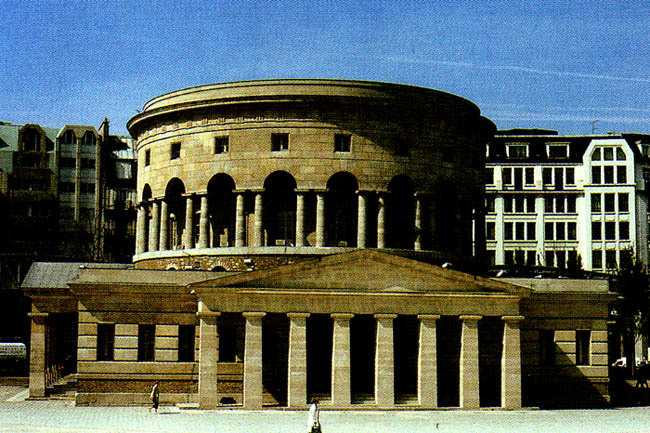 Ledoux has mounted a huge rotunda on a square base, which is entered through a Greek portico supported by pillars instead of columns. (All four sides are identical in appearance.) 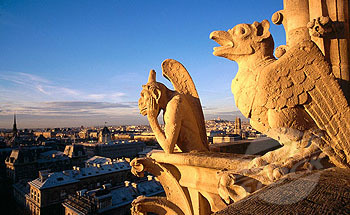 Although the structure derives from antiquity, the effect is anything but classical. Visually the portico seems almost crushed by the burden of the rotunda, whose massiveness is barely relieved by the strangely medieval-looking screen of arches over paired columns (compare fig. 418). 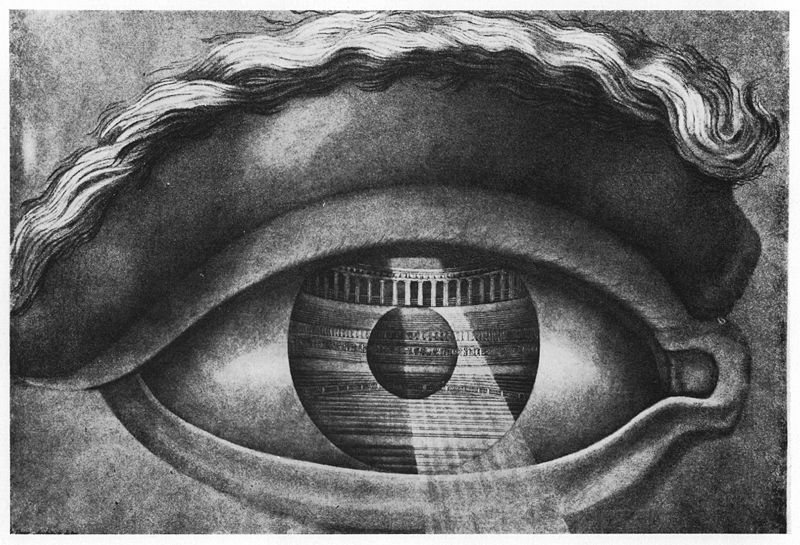 Implicit in the radically simplified forms and decidedly odd proportions is a critique of all earlier examples of the same type, from the Pantheon (fig. 253) through Soufflot's Ste.-Genevieve (fig. 871). (See also figs. 583, 703, 819, and 868.) The building, nearly Mannerist in its gestures, is among the most peculiar of any before Wright's Guggenheim Museum, which may be regarded as its descendant. 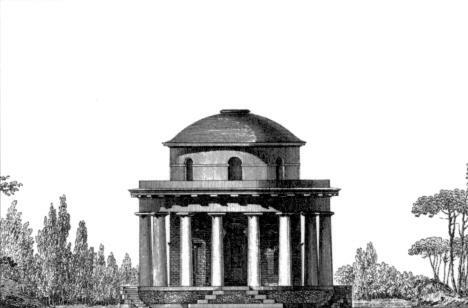 Claude-Nicolas Ledoux, (born March 21, 1736, Dormans-sur-Marne, Fr.�died Nov. 19, 1806, Paris), French architect who developed an eclectic and visionary architecture linked with nascent pre-Revolutionary social ideals. Ledoux studied under J.-F. Blondel and L.-F. Trouard. His imaginative woodwork at a café brought him to the notice of society, and he soon became a fashionable architect. 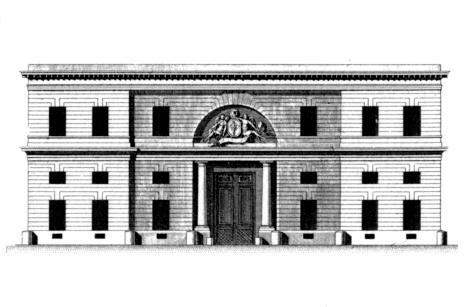 In the 1760s and early �70s he designed many private houses in an innovative Neoclassical style for the higher social circles in France. 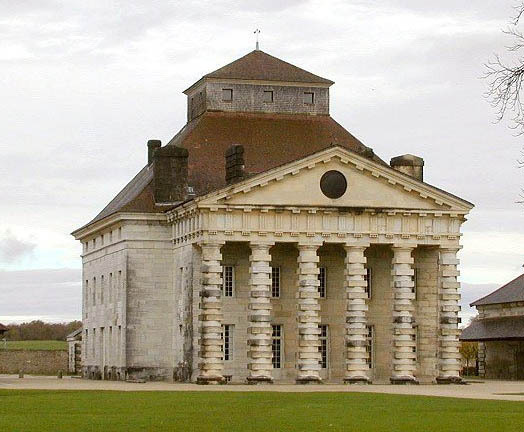 Among such few surviving works are the Pavilion Hocquart (1764�70), the Château de Bénouville, Normandy (1770), and the famous chateau for Madame du Barry at Louveciennes (1771�73). In the mid-1770s Ledoux took on the planning for a new saltworks and its surrounding town at the Salines de Chaux, at Arc-et-Senans. 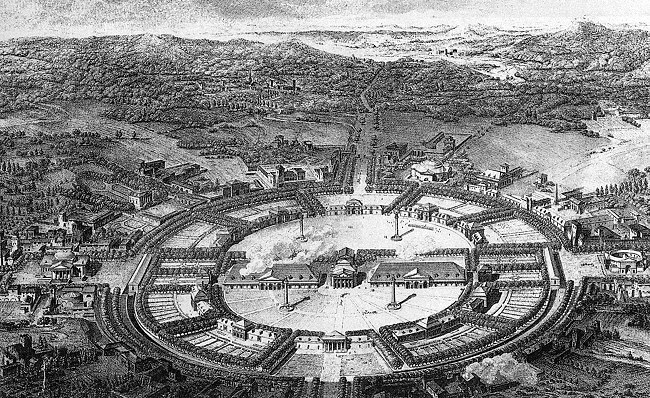 He devised a radial concentric plan for the settlement, with rings of workers� dwellings enclosing a central salt-extraction factory. Less than half of the project was completed, but the remaining structures show Ledoux�s striking simplifications of cubes and cylinders to create squat, massive, boldly rusticated (rough-hewn) versions of classical building types. His layout of the town to both facilitate economic production and ensure healthy and happy conditions for the workers anticipated similar planning efforts by Robert Owen and other 19th-century Utopian socialists. 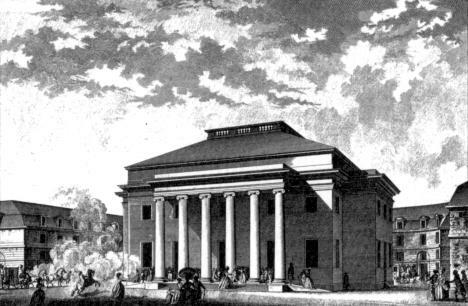 Ledoux�s Theatre of Besançon (1771�73) was a revolutionary design in its provision of seats for the ordinary public as well as for the upper classes. 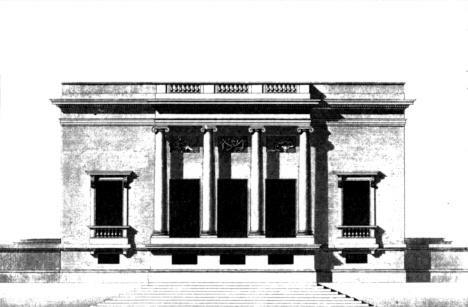 The private houses he designed in the 1780s had brilliantly eccentric features, including odd layouts, discontinuous elevations, and a striking use of Doric architectural elements. Ledoux�s most important public project in the last phase of his career was to design 60 tollhouses situated at the city gates of Paris. He turned what might have been modest customs offices into a series of monumental gates and other structures called the Portes de Paris. Of the 50 such tollhouses, or barrières, actually built (1785�89) in the four years preceding the French Revolution, only four, including the famous Barrière de la Villette, still survive. 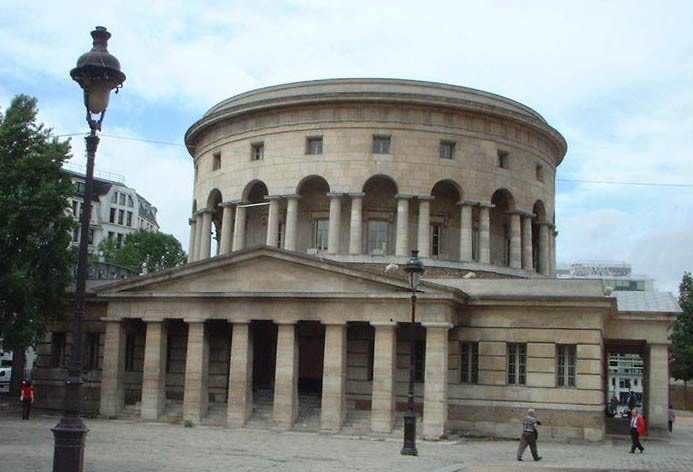 In the barrières Ledoux took his interest in squat, colossal geometric forms to its furthest extent, fashioning rotundas, Greek temples, porticoes, and vaulted apses with rusticated masonry and Doric columns. 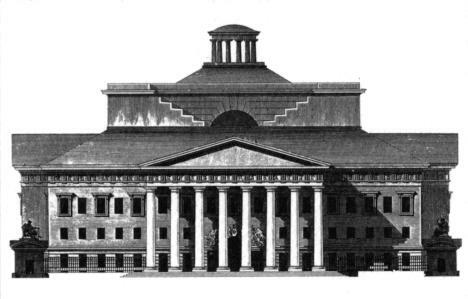 The cost of these buildings proved ruinous to the public treasury, however, and he was dismissed from his project in 1789. Many of the barrières were subsequently torn down by mobs of resentful taxpayers during the Revolution. Ledoux himself was arrested during the Terror, and this event and the deaths of several members of his family ended his active career as an architect. 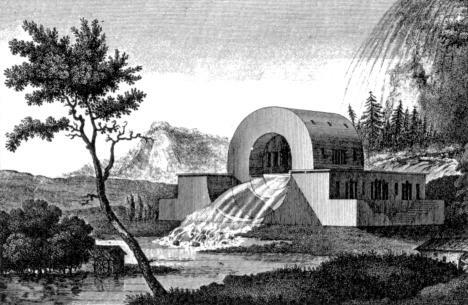 After his release he spent his last years writing and compiling L�architecture considérée sous le rapport de l�art, des moeurs et de la législation (1804; �Architecture Considered with Respect to Art, Customs, and Legislation�), which contains his own engravings of his works. 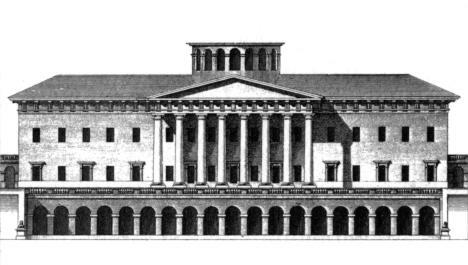 Ledoux was the most prolific, productive, and original architect of late 18th-century France. The powerful and brilliantly simplified geometry of his buildings held little appeal for the following generations, however, and wholesale demolitions and vandalism during the 19th century left only a handful of his works still standing. Among them is his saltworks at Arc-et-Senans, which UNESCO designated a World Heritage site in 1982.
et 15 rue de Montmorency, Paris. Elévation de la façade sur la rue Michel-le-Comte. seen in the mirror of an eye.